For other people named Malachy, see Malachy (disambiguation). 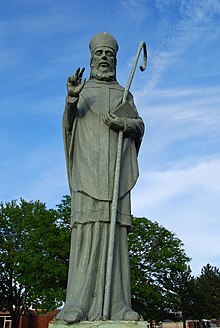 Saint Malachy (Middle Irish: Máel Máedóc Ua Morgair; Modern Irish: Maelmhaedhoc Ó Morgair; Latin: Malachias) (1094 – 2 November 1148) was an Irish saint and Archbishop of Armagh, to whom were attributed several miracles and an alleged vision of 112 Popes later attributed to the apocryphal (i.e. of doubtful authenticity) Prophecy of the Popes. It is now believed by scholars that this document was a forgery created by Cardinal Girolamo Simoncelli. Saint Malachy was the first native born Irish saint to be canonised. His brother was Gilla Críst Ua Morgair who later became Bishop Christian of Clogher from 1126 to 1138. Máel Máedóc, whose surname was Ua Morgair, was born in Armagh in 1094. St. Bernard describes him as having noble birth. He was baptised Máel Máedóc, which was rendered Malachus in Latin (and subsequently as Malachy in English) and was trained under Imhar O'Hagan, subsequently Abbot of Armagh. Imhar was in sympathy with the aims of those who sought to reform the Irish church, and it was probably through his influence that Malachy became imbued with their principles. After a long course of studies Malachy was ordained priest by St Cellach (Celsus) in 1119. Shortly afterwards Cellach made the young priest his vicar. For the next year or two it was Malachy's duty to administer the diocese of Armagh. He established in all the churches the apostolic sanctions and the decrees of the holy fathers, and the customs and practices of the Roman Church. He introduced the Roman method of chanting the services of the canonical hours and instituted a new Confession, Confirmation, the Marriage contract, which those over whom he was placed were either ignorant or negligent. With the consent of Cellach and Imar he went to study under St. Malchus, who had by this time retired from the archbishopric of Cashel and was settled at Lismore. He spent three years there. In 1123 the coarb of Bangor Abbey died. Bangor was the principal religious site in the north-east of Ireland. Since he ended his days at Lismore, it may be assumed that he was a friend of Malchus, and of the movement with which he was identified. His successor, who was Malachy's uncle, expressed his willingness to surrender his office and the site of the monastery to his nephew. Malachy became Abbot of Bangor Abbey. This became an opportunity to implement one of the canons of the Synod of Rathbreasail, which by establishing the diocese of Connor. Cellach, as coarb of Patrick, and consecrated bishop, had been able to organize the diocese of Armagh in accordance with the Rathbreasail plan. With the prestige which belonged to the coarb of Comgall, Malachy, if consecrated bishop, could probably succeed in organizing the diocese of Connor. In 1124 Malachy journeyed to Bangor, was installed as abbot, and was made bishop by Cellach. In 1132, he was promoted to the primacy of Armagh. St Bernard provides many interesting anecdotes regarding St Malachy and highly praises Malachy's zeal for religion both in Connor and Armagh. In 1127, Malachy paid a second visit to Lismore and acted for a time as confessor to Cormac MacCarthy, Prince of Desmond. While Bishop of Down and Connor, Malachy continued to reside at Bangor, and when some of the native princes sacked the two dioceses of Down and Connor, Malachy brought the Bangor monks to Iveragh, County Kerry, where they were welcomed by now King Cormac. On the death of St Celsus (who was buried at Lismore in 1129), St Malachy was appointed Archbishop of Armagh, 1132, which dignity he accepted with great reluctance. Owing to intrigues, he was unable to take possession of his See for two years; even then he had to purchase the Bachal Isu (Staff of Jesus) from Niall, the usurping lay-primate. St Malachy's influence in Irish ecclesiastical affairs has been compared with that of Boniface in Germany. During three years at Armagh, as Bernard of Clairvaux writes, St Malachy restored the discipline of the Church, grown lax during the intruded rule of a series of lay-abbots, and had the Roman Liturgy adopted. St Malachy worked zealously to restore ecclesiastical discipline, restored marriage, renewed the practices of confession and confirmation, and introduced Roman chants in the liturgy. He was also known for his care to the needy as a miracle worker and healer. In his lifetime, he planted apple trees throughout Ireland during time of famine. St Bernard continues: Having extirpated barbarism and re-established Christian morals, and seeing all things tranquil, St Malachy began to think of his own peace. He therefore resigned the Sees of Armagh and Connor, in 1136 or 1137, but retained as Bishop of Down. He founded a priory of Austin Canons at Downpatrick, and was unceasing in his episcopal labours. Early in 1139 he journeyed to Rome, via Scotland, England, and France, visiting St Bernard at Clairvaux, Champagne. He petitioned Pope Innocent II for pallia for the Sees of Armagh and Cashel, and was appointed legate for Ireland. On his return visit to Clairvaux he obtained five monks for a foundation in Ireland, under Christian, an Irishman, as superior: thus arose the great Abbey of Mellifont in 1142. St Malachy set out on a second journey to Rome in 1148, but on arriving at Clairvaux, he fell sick and died in the arms of St Bernard, on 2 November 1148. In the book Life of Saint Malachy, his biographer Saint Bernard of Clairvaux says Malachy was distinguished by his meekness, humility, obedience, modesty, and true diligence in his studies. Saint Charles Borromeo praised St Malachy for attending to the needy, bringing the holy sacraments to all alike and renewing the fervor of the people in receiving them. St Malachy's feast is celebrated on 3 November, so as not to clash with All Souls Day. The Visio Tnugdali written c.1149 refers to Malachy as follows- When Saint Ruadan had fallen silent, Tundale looked happily about him and saw Saint Patrick of Ireland, dressed in shining robes alongside many bishops decked out in their finest regalia. They were all joyful and there was no sound of any sighing! Among that blessed company Tundale could see four bishops whom he recognised. They were all good men; one of them was Saint Cellach, a former archbishop of Armagh, who did much good for the sake of Our Lord. Another was Malachias O'Moore, who had become archbishop of Armagh after him and gave everything that he had to the poor. He founded a large number of churches and colleges, as many as forty-four in all, endowed them with land and rents and so allowed many men of religion to serve God devotedly, although he hardly retained enough for himself to live on. St. Malachy's body remained at Clairvaux Abbey and eventually was placed in a tomb near Bernard of Clairvaux's, after the abbot's own death. The tomb was moved several times with the rebuilding of the church. Portions of his remains were sent to Ireland in 1194 and deposited at Mellifont Abbey and other abbeys of the Cistercians. At some point at Clairvaux, part of Malachy's arm and part of his skull were removed and placed in special reliquaries in the abbey's treasury. His arm was kept in a silver case decorated with precious stones. A portion of his skull was kept in a bust reliquary of gilt silver, also decorated with precious stones and topped by a mitre. These reliquaries may have been enameled or painted. During the French Revolution, the reliquaries themselves were destroyed, although the relics were preserved. Malachy's head is now preserved in a reliquary in the treasury of Troyes Cathedral, not far from the site of Clairvaux. The tombs of the two friends and saints were destroyed in the aftermath of the revolution, and the bones were commingled and distributed to various parishes in the district of Clairvaux. Ph. Guignard published an account of the relics in the Patrologia Latina. Malachy is patron saint of the Archdiocese of Armagh and the Diocese of Down and Connor. The Dominican Abbey at Carlingford (est. 1305) was dedicated to him. Saint Malachy's Church, Belfast was intended to be the Cathedral Church of Down and Connor dedicated in honour of the Diocesan Patron. However, the Irish Famine broke out and the grand plans for the Saint Malachy's Cathedral were shelved to divert funds to the needy. A number of parishes are dedicated to St. Malachy, including those in Brownsburg, Indiana; Burlington, Massachusetts; Kennedy Township, New York City (The Actors' Chapel); Philadelphia, Pennsylvania, Geneseo, Illinois and Rantoul, Illinois. A "Prophecy of the Popes" is attributed to St. Malachy, which is claimed to predict that there would be only 112 more popes before the Last Judgment. Benedictine Arnold de Wyon discovered and published the so-called "Doomsday Prophecy" in 1590. Most scholars consider the document a 16th-century elaborate hoax. James Weiss, a professor of church history at Boston College, has stated: "It is widely thought ... given who the author was and his relationship, [that the prophecies] were published to establish the case for election of one particular cardinal." Thomas Groome, chair of the Department of Religious Education and Pastoral Ministry at Boston College, has a similar notion: "For myself – and even as a native Irishman – the 'Prophecies of St. Malachy' are a grand old fun tale that have about as much reliability as the morning horoscope". Thomas J. Reese, SJ, of Georgetown University, had only this to say: "St. Malachy's prophecy is nonsense." St Malachy, his "Doomsday Prophecy", and the conflicts between the Christians and pagans are important plot points in James Rollins' sixth Sigma Force novel, The Doomsday Key (2009), particularly in Chapter 21. ^ a b c Grattan-Flood, William (1910). "St. Malachy". The Catholic Encyclopedia. New York: Robert Appleton Company. 9. Retrieved 25 May 2013. ^ "Who Was St. Malachy?". Saint Malachy Catholic Church. Kennedy Township, Pennsylvania. ^ Bernard of Clairvaux, The Life and Death of St. Malachy the Irishman, translated and annotated by Robert T. Meyer (Kalamazoo, MI: Cistercian Publications, 1978), p. 5. ^ "Who Is Saint Malachy?". Saint-Malachy.org. Saint Malachy Parish, Burlington, Massachusetts. Archived from the original on 17 March 2013. ^ O'Hanlon, John (1859). The Life of St. Malachy O'Morgair. Dublin: John O'Daly. pp. 188–213. ^ "Patrologia Latina". Internet Archive. Migne. pp. 1661–1798. PL 185 bis. ^ "Welcome". St. Malachy Parish. Brownsburg, Indiana. Archived from the original on 2 June 2013. ^ Lorenzi, Rossella (13 February 2013). "Resigning Pope Brings Doomsday Prophecy". Discovery News. ^ a b c Sieczkowski, Cavan (19 February 2013). "St. Malachy Last Pope Prophecy: What Theologians Think About 12th-Century Prediction". Huffington Post. ^ James Rollins. "Review: The Doomsday Key". Bookreporter. Retrieved 22 September 2014.